Version control provides more control over collaborative flows by allowing users to work on different "forks" of the same collection. They can later merge and pull changes between these forks to keep the collections up to date with each other. You can 'fork' a collection in a personal or a team workspace. To fork a collection, either the workspace must belong to you or you should be a member of a team workspace. In Postman, the fork whose changes you want to merge into a parent is the source, and the parent itself is the destination. Note: If there are any mocks or monitors associated with a collection, they will not be available with the forked collection. You will have to create the mocks and monitors again. It's easy to view changes, review them and then merge. This section describes how to merge changes made in your fork with the parent collection. Let's change the name of the forked collection in the above example to HealthAPICheck - Forked Collection which is part of Team-Cobras workspace. Merge changes: Changes made in your fork will be merged into the parent. Merge changes and update source: Changes made in your fork will be merged into the parent and the fork is updated. 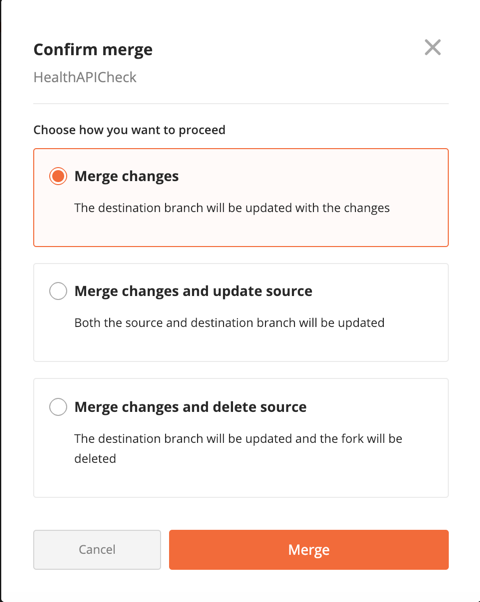 Merge changes and delete source: Changes made in your fork will be merged into the parent and the fork is deleted. Choose either of the options and click 'Merge'. A conflict occurs in Postman when two or more users make different changes to the same request/folder/examples simultaneously. In such a scenario, Postman will not be able to decide which of these changes to retain. As shown in the above screen, the source is displayed in Orange color which indicates the changes you made. The destination is shown in Blue color which indicates the changes made by someone else. Click Use this to make the selection to resolve the conflict. Note: Clicking Use this button only makes the selection of your choice. You still need to merge the changes by clicking Merge all changes button and then making the selection thereafter.